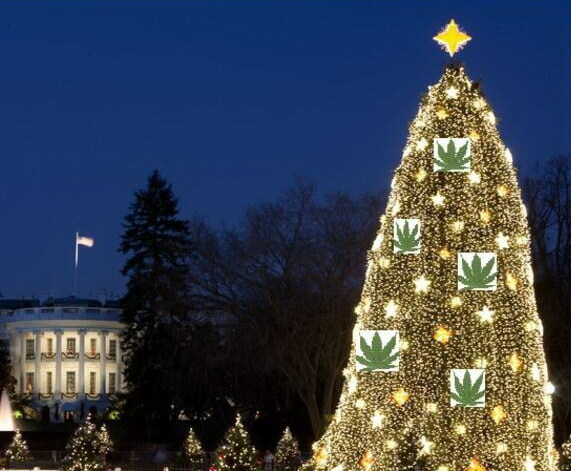 Is White House Tree Decked with Marijuana? Home Entertainment Is White House Tree Decked with Marijuana? While Sasha, Malia, and Michelle Obama greeted the arrival of the Blue Room’s Christmas tree on Friday, many in Colorado finished their brownie baking and hemp ornament making just in time to ensure their boxes would be packed for the shipment earmarked to deck the other “O Tannenbaum,” which will dawn 5,000 of their hand-crafted decorations. Yes, those clever folks from Colorado have worked ’round the clock, only taking their self-authorized 4:20 breaks in order to meet former President Bill Clinton’s request for “Celebrating Our Great Outdoors” theme. Thanks to their efforts, a magnificent 65-foot Englemann Spruce will finally end up as the famous Capitol Tree after travelling through several communities on its way to Washington DC this week. It is quite curious as to how the secretary of state’s husband got involved in the merry Colorado acquisition. My sources from Washington state’s Hempfest liberally informed me that Clinton’s bucket list did indeed include him finally inhaling a certain “controlled substance.” Apparently, in the spirit of giving, Clinton offered to assist in the transaction of the tree and decorations from “The Centennial State.” After several Google searches of how to transport cannabis in ornaments, and numerous phone calls to a friend, the former president discreetly worked out the deal with some University of Colorado students. Sources say the paraphernalia and weed should safely arrive in time for the House Speaker John A. Boehner (R-Ohio) to get his recently bulk-ordered brand of eye redness reduction solution shipped before he lights the tree on Dec. 4. There was some good news for the economy and President Barack Obama this week as Zig-Zag rolling paper’s stock rose significantly since two Western states made it OK to toke. After Obama finished rolling a few of his own fatties, several secret service individuals were seen arguing over who should train the Commander-in-Chief how to re-roll them so the new ones exiting his Marlboro pack were not thicker than the others.